In Elizabeth, the dark cinematography underlined the intrigue involved in solidifying the naive queen's new reign over England. Geoffrey Rush's Walsingham was not only her most loyal subject. Like Corleone's bodyguards, he was an assassin always hiding in the shadows and the edge of the frame. He struck whenever necessary to solidify his queen's power. Kapur's montage of assassinations at its finale clearly drew parallels with Michael Corleone's consolidation of his power in the first Godfather. In The Golden Age, the bright cinematography reveals a more progressive England, one in which Elizabeth is now confident to say she has no fear of her Protestant court being toppled by England's Catholic subjects. She is ruler of all of England, not just its Protestants. Cate Blanchett's performance is one that potentially rivals that of Pacino's Michael Corleone. Pacino's performance over three films is unrivalled in American cinema. His evolution from naive All-American soldier returning from WWII, to coldly calculating patriarch of his clan, to repentant, dying shadow is one of the great modulated performances in film. Pacino's stillness was even more terrifying than his explosiveness, in his depiction of evil. 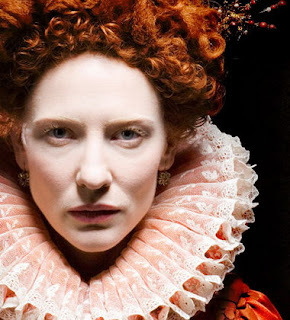 Blanchett also started as a naive young princess in the first movie. She left love behind to build the steely character that men followed in the first Elizabeth. In The Golden Age she forgets that, allowing her "virgin" queen to be tempted by Clive Owen's rakish Walter Raleigh. But as she is reminded by the continued attacks on her rule, she cannot afford to be feminine. By remaining a "virgin" she leaves the door open to alliances with male kings. By remaining childless she can continue to be mother to her people. This realization is illustrated in the shining porcelain cast of her face. Blanchett's Elizabeth is now a jaded casualty of war, not just in the form of the Spanish invasion, but the war of the sexes. The bright tones also reveal much of The Golden Age's flaws. In Elizabeth this was never an issue, as the shadows were frequently used to frame the faces of the performers. But the crisp cinematography here only serves to highlight the emptiness of the film. The movie gets bogged down in the ostentatious costuming and set design. Kapur's framing favors the architecture over the actor. The characters are dwarfed by their surroundings. Walsingham, who was so ominous in the first film, is now a doddering old man in the sunlight. The CGI effects of the naval battles detract from the story being told. At those moments the films takes on the detached feeling of a video game. Where the warm darkness of the first film strips away time and place to depict the universality of its story, the sequel feels colder and more distant. It feels like an historically accurate artifact to examine, not a passionate story to experience.